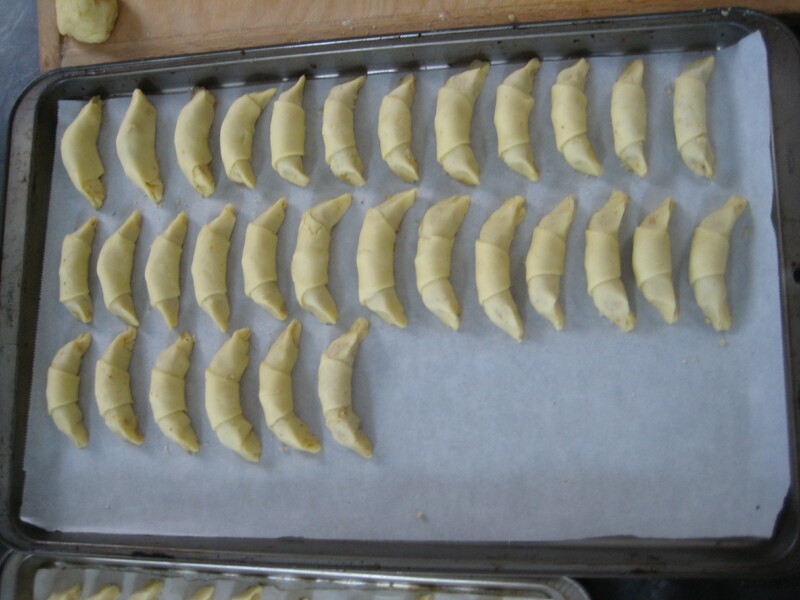 ‘Kifli’ is a very common Hungarian yeast dough pastry, cut into triangles and rolled up into a crescent shape. There are savoury ones and sweet ones. 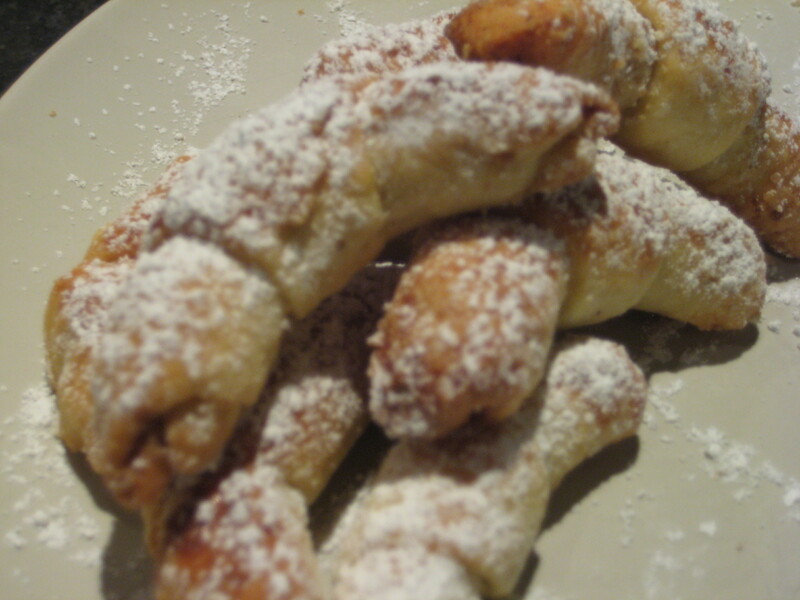 I grew up with a sweet one made with a walnut filling. Kifli are a staple during the holidays and I recently made kifli with my grandma Ann. When I first got the recipe for kifli from her she explained the dough needed to rest in the fridge overnight. I thought, great, i’ll make the dough and come by the next day and learn how to roll the cookies. Before the plans were solidified she says to me ‘I think you should come here and make the dough, I don’t trust you’ll know how to do it right’. She was right (head hung). When it comes to cookies, these are a bit labour intensive, but once you get the hang of it, and are well supervised :), time flies. I’ll do my best to explain, but I agree that it takes practice, a trained eye and taste experience to know what is a ‘good’ dough, filling and end product. 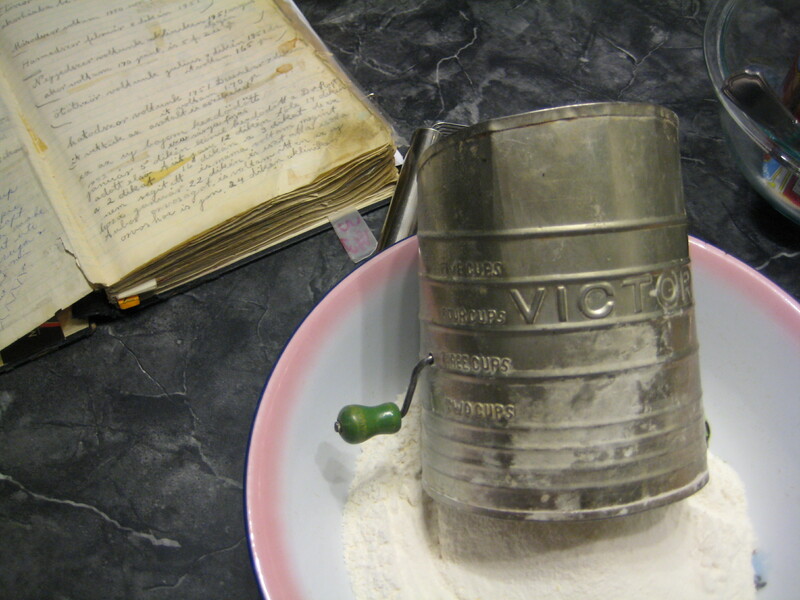 Sift the flour and salt together (that sifter of grandmas is older than ME!). 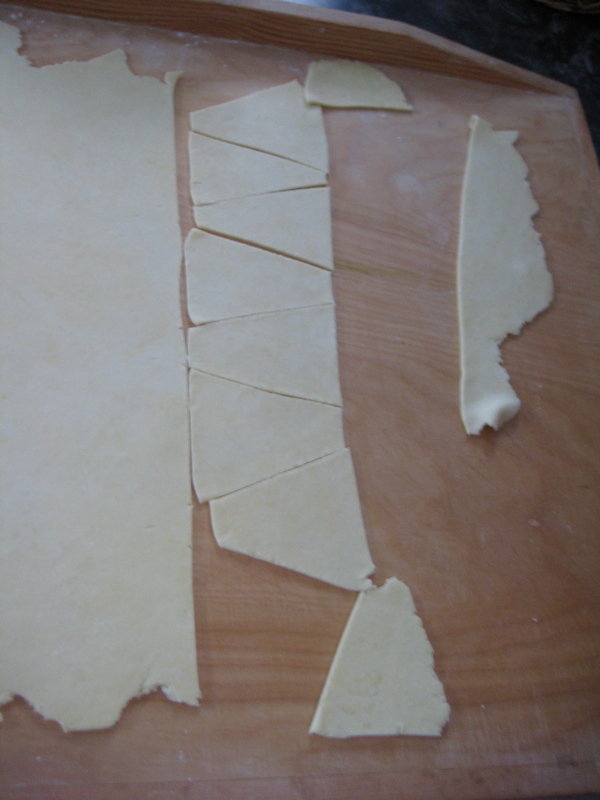 With a pastry cutter, cut the butter into the flour mixture. 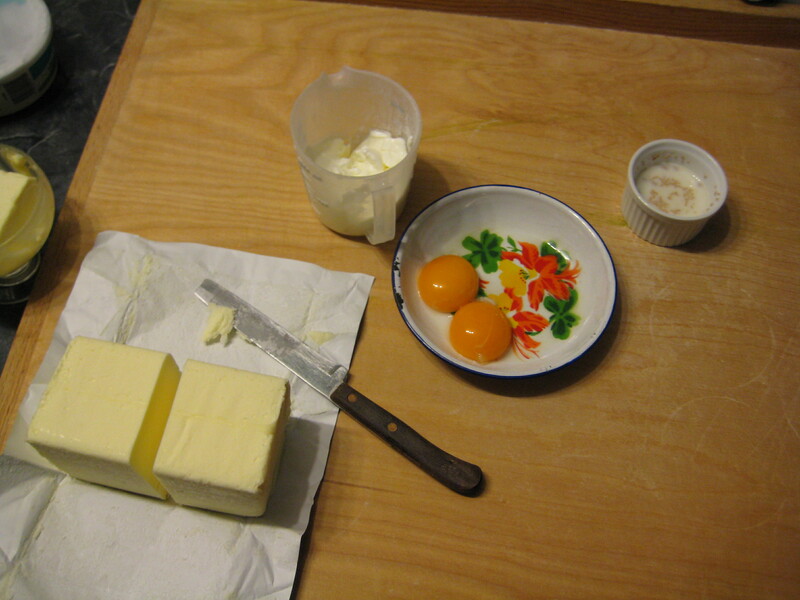 Mix the sour creme, yeast mixture, lemon juice and eggs together. Add the wet to the dry, mix with a spoon, folding over until it is blended. Then with your hands form it into a ball. On a floured surface, kneed a few times to incorporate all the ingredients, not too much or it toughens. Cut into two pieces, put in fridge over night. 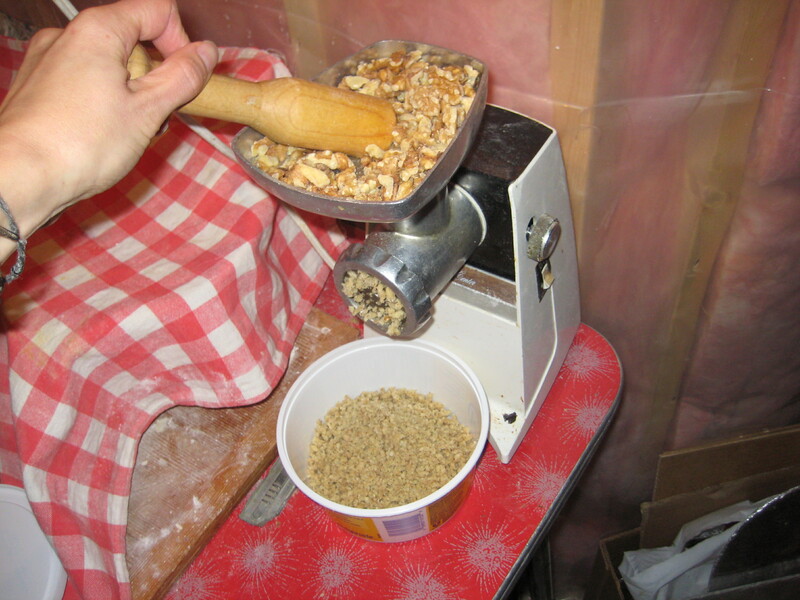 For the filling, grind the walnuts, check out that old grinder. 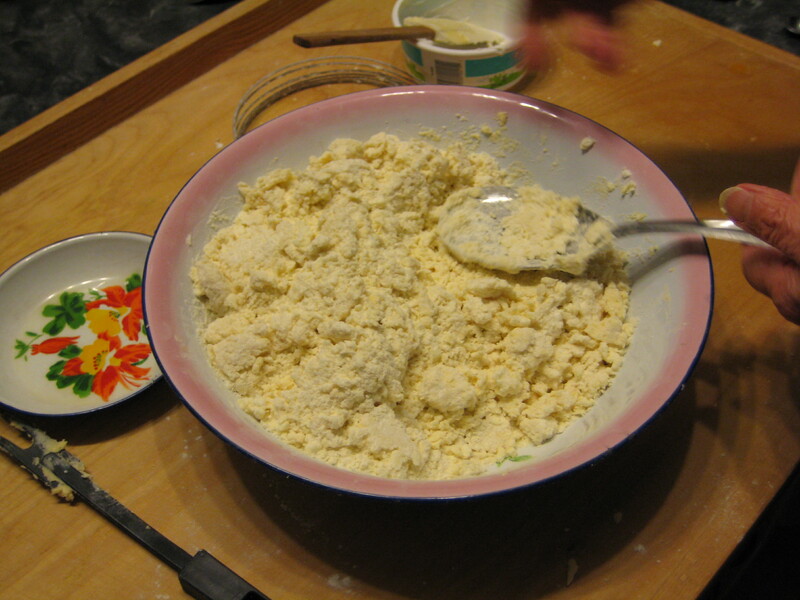 A food processor will work, but be careful not to pulverize them into powder, they need to be a course grind. Mix in grated lemon rind and sugar. The cookies call for the evil white sugar – now i’ll experiment with alternatives one day, but 1/2 cup of sugar for 85+ cookies, i’ll live. My grandma makes them low in sugar because her mother watched her sugar intake. Nice. 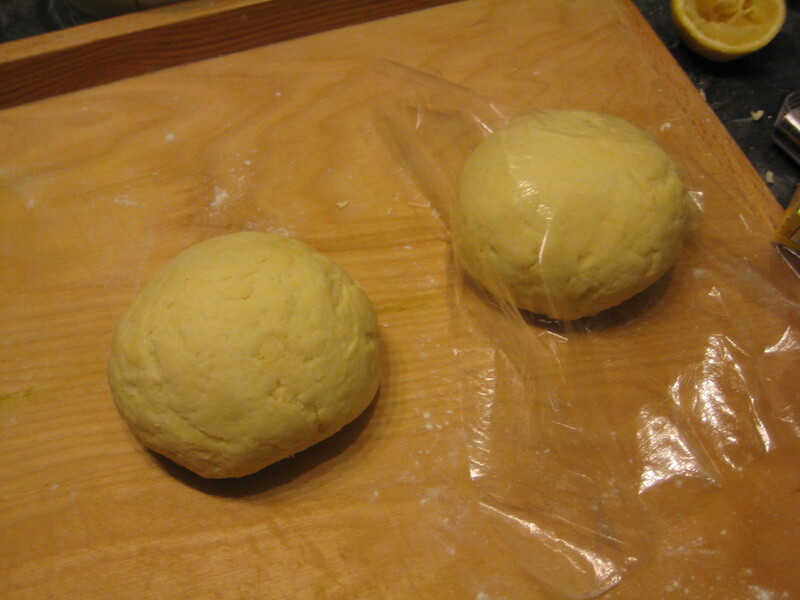 After the dough has sat in the fridge overnight, no longer than 12 hours, take out and let rest at room temperature for a couple of hours so you can roll it out. Roll out on a dusting of flour, turning and flipping over until dough is about 2mm in thickness? Cut into triangles 3.5″ across and about 45 degrees. Again, this isn’t going to be easy to explain here. Fill the base of the triangle with a spoon of filling, tuck the corners in a bit, roll, stuffing the filling as you go, brushing extra aside. Tip of triangle needs to be on the bottom of the roll so it doesn’t unravel while baking. Brush with egg white and bake for about 20 min in 375 degrees until golden brown. To serve, sprinkle with powdered sugar. That doesn’t do it justice but I don’t expect a pastry beginner to give this a shot. If you do, let me know how you do. By the way, and although she might not admit it in public, grandma said (sipping her tea and watching me) that my kifli were perfect, like i’d been doing it my whole life. Perfect. That’s right, must be in the genes. I had the pleasure of eating several (ahem) of these the other day, infused with Natalie’s care and love. They are amazing! They WERE perfect. Perfectly delicious. Yum.